When looking to the best places to go paddle boarding or kayaking in St George the list grows much larger than you’ll anticipate. Especially if you expand the list to be best spots near St George to go SUPing, as within 2 hours of St George there are a bunch of reservoirs and places to see, and waters to experience. Each SUP spot has its positives and negatives, so we’ll try (in our opinion) to tell you about all of them, and then give you the positives and negatives for each of them. A perfect example of the good and the bad for each reservoir is Sand Hollow. It is easily the most recognizable reservoir in St George. With its stunning scenery, incredible cliff jumping, and fantastic sand beaches it’s hard to image a better place to go paddle boarding. But due to its popularity the waters are often quite choppy, so it’s usually a little bit of a harder place to learn how to paddle board on. 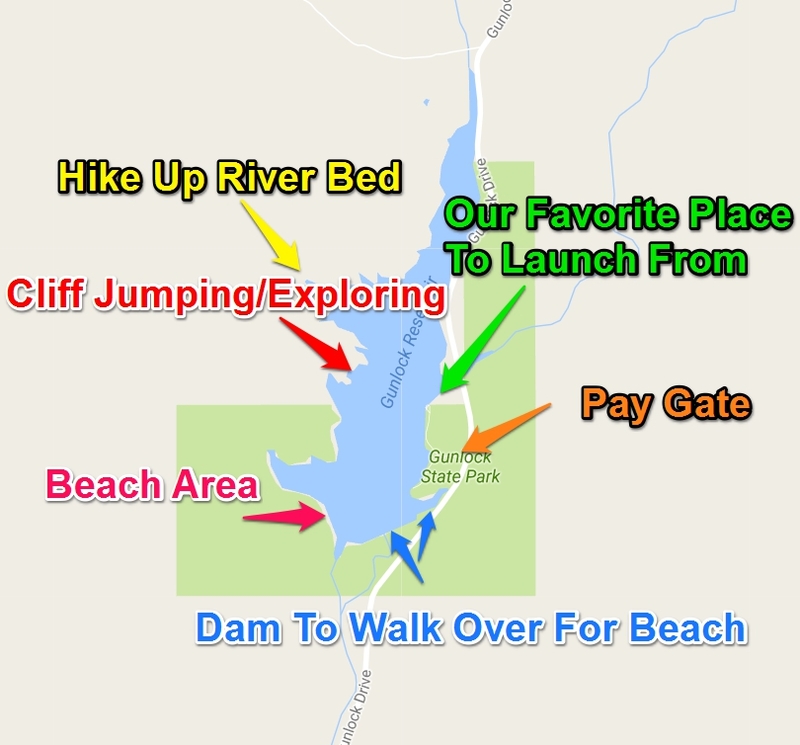 But we will go into each reservoir here and give you the full skinny on them so you can decide which spot is your spot. The Good: If it’s just the best paddle boarding location in St George that you’re after, then Gunlock is one of our favorite spots. It doesn’t have the beaches, or the vast view that Sand Hollow has, but since it’s less popular with boaters the water is much calmer. It has some great places to go exploring across from the dock, with some coves, and rocks you can go cliff jumping off. When the sun starts to go down the red mountain to the east lights on fire for about 20 minutes, and it is incredibly pretty. The Bad: It’s slightly further from St George, and if you’re looking for a great beach then you’ll have to walk a bit across the dock to the west side (no automobile access). Gunlock can get a little lower as the summer progresses, so the water can get a little muddy at times, but it’s usually not an issue. Gunlock is one of our favorite locations. It’s pretty, it’s calm, often times you’ll be the only ones on the lake. There are fun places to go exploring at, there’s a great cliff jumping spot, it’s just a great SUP location near St George. The Good: Since improving Ivin’s Reservoir in 2016 it has become a great place to go kayaking or paddle boarding to. It has two sections to it, the smaller section is a man made beach/swim area that’s perfect for little kids to swim in until there heart’s content. The second is the main reservoir with although it is small, offers without a doubt the most stunning reservoir views of all southern Utah lakes. In the evening time when the sun’s going down those red hills to the north light on fire, it’s truly incredible. This is the perfect spot for younger kids. The Bad: Ivin’s is more of a half day lake, as it’s much smaller than all of the rest. So you won’t plan on spending all day out there as you might get “over it” quickly. There are no camping spots, and fire’s aren’t allowed either so you are somewhat limited. Younger kids will love it, but older kids might get bored sooner than other places. Ivins is the perfect place to go for a quick trip. Maybe a sunset dinner on the beach to watch those red mountains light on fire? But don’t plan on spending too much time here as it’s small size is noticeable. The Good: Much like Sand Hollow, Quail Lake is very easy to access being only 20 minutes give or take from St George. It’s a beautiful lake that is less choppy (especially if you are at the north west side) due to it not being as popular as Sand Hollow. During the springtime when the water level is at its peak you can go explore through the trees where the water comes into the reservoir. It’s one of the prettiest spots in all of southern Utah to go paddle boarding in. The Bad: The beaches aren’t great at all. So if it’s sandy beaches that get you going then Quail Lake is not your spot. When compared with Sand Hollow it’s not quite as beautiful as the views are blocked by the mountains that surround it. We love Quail Lake, especially during the springtime when the water is at its peak. That’s when you get explore the northwest inlet, there among the trees. It’s very beautiful there and fun to check out. There are also less boats than on Sand Hollow which means calmer waters. The Good: If you want easy access, beaches, versatility, and beauty then Sand Hollow is your spot. Sand Hollow is a beautiful as it is functional. I has above and beyond the best sand beaches of any reservoir in southern Utah. The view northward of the Pine Valley mountains perfectly frame the picture, making for a truly beautiful reservoir. There’s fun places to explore among the rocks, and don’t miss out on the popular cliff jumping spot. Sand Hollow is always chocked full of boaters, anglers, and wave-runners, so it truly is so versatile. It’s access is also the easiest and most convenient from St George (and surrounding areas). With the newly completed freeway that connects the airport to the reservoir the access has only gotten better. You can be to Sand Hollow from most anywhere in St George in about 20 – 30 minutes. The Bad: Due to its many positives, it makes Sand Hollow a very busy lake. Which means the water is often choppy and a little harder to go SUPing on. If you stick near the rocks on the western edge then you’ll be fine, but this isn’t where the main beach area is (that’s at the southern most area of Sand Hollow). If you like sandy beaches, sunsets, stunning views, and big open water then Sand Hollow is for you. You’ll have to endure choppy water, lots of boats, possible swimmers itch, and little to no seclusion though. Need to Rent a Paddle Board, Kayak, or Giant Paddle Board?